I was at a matinee performance of Hamlet at the Stratford Festival in May of 2016, looking down at the action from way up in the balcony, surrounded by Canadian High School students. Two young women in front of me spent the afternoon making out. But I’d heard the story was good, and I wanted to see how things would turn out, so their performance did not distract me. I enjoyed the production because it reminded me of my first and my last appearance as an actor in a Shakespeare play at The Depot Theatre in Champaign, Illinois in 1968. I was Guildenstern; Hamlet was played by Tom Rickman, who later went on to have a pretty good career as a screenwriter in Hollywood. We codirected the play, which became known by my colleagues at the University of Illinois as the S.D.S. Hamlet. People were not uniformly happy about the way Hamlet’s melancholia was expressed as misogynist rage, and they were more than a bit shocked by his physical abuse of Ophelia. She was not the usual beautiful young Ophelia who turns up in most productions. This Ophelia was Polonius’s unattractive daughter who nobody wanted to marry, a casting decision that changes everything without changing anything. It was also obvious Hamlet was having his way with her. The characters—not the actors. As Guildenstern I felt menaced by Hamlet because Tom was menacing on that stage, and I worried I might fall off onto the concrete floor. I was in a play there once—it was called The Bulgarians—where I was thrown out the “window” of a “train” in pitch darkness and actually landed on that floor a few times. My character died; I managed to survive the experience. At Stratford, Hamlet was anything but menacing; Rosencrantz was a nonentity; and Guildenstern dominated all my scenes as well he should. He had no trouble restraining the Prince of Denmark—or the Prince of Darkness, come to think of it—when he became physically aggressive. Ophelia looked like Ophelia is supposed to look. At the end of the performance, a nice-looking boy stood up and asked no one in particular “Why did they both die in the sword fight?” I would bet money he still has a light saber in his bedroom closet. He was tall and beautiful and unconvincing in his newly fashioned adult persona. So, in other words, everything was as it should be. I leaned over and explained what took place, including the detail of the unbated foil. He looked puzzled at first, but after a while he got it, politely thanked me, and said he really enjoyed the show. The fencing was entirely clear to my way of thinking, but of course everything depends on how well you understand the conspiratorial scene between Claudius and Laertes, which won’t mean much to someone who has never heard of fencing and doesn’t know what on earth an unbated foil would be. They never say “fencing.” They always say “sword fight.” It’s too bad really. Fencing is fending, from the Latin verb fendere, to strike. In a fencing match you try to strike your opponent and at the same time you’re trying to fend off his attempts at striking you, which is exactly what’s going on in Hamlet much of the time, with different characters trying to foil each other’s plots. Fencing of the kind you can read about in the early modern fencing manuals is seldom actually seen on the contemporary stage. What you’re mostly getting is a sword fight in the cinematic Errol Flynn/Kenneth Branagh tradition. Go to a fencing match at the next Olympics and you’re going to see something that looks a lot different from all that wide open swinging, rolling and leaping about that looks cool, but you’re going to be a dead duck if you’re up against a real fencer. When we staged this play at The Depot Theatre long ago in 1969, we did not have any foils and nobody knew how to fence. One night after rehearsal, I was walking home with Hamlet and Laertes and we passed a sporting goods shop where, prominently displayed in the window, were two gleaming fencing foils with stylish hilts. I looked at Laertes. He looked at me and said, “See you guys tomorrow.” The next afternoon at rehearsal Hamlet and Laertes were brandishing two brand new fencing foils, but nobody asked any questions except, “How are you supposed to use these things?” One night during a performance a six-inch-long piece broke off one of the foils, sending a shower of sparks over the front row of the audience. Miraculously nobody was hurt. Hamlet is full of words derived from fendere: “Such words include ‘offend,’ ‘offended,’ ‘offender’s,’ and ‘offence.’” The words “defend” and “defence” also appear. And in the gravediggers’ hilarious routine in Act 5, there is the pseudo–legalese phrase, ‘se offendendo,’ ‘in self–offense.’”[i] This turns out to be a key notion throughout the action, from the engineer hoist with his own petard, to Laertes’s dying confession, “I am justly killed with mine own treachery” (5.2.337) all the way to Horatio’s “purposes mistook / Fall’n on th’ inventors’ heads” (5.2.426–7). I thought about this afterward and found myself asking if my beautiful young man with the unconvincing adult persona would avoid self-offense in some as-yet-to-be determined future situation. Probably not, hein? As for me, I wept during Ophelia’s mad scene, and I was angry with Hamlet for treating her so shabbily. This is something that happens with older men—you lose your manly inhibition against crying. So it was good to feel how sad this story is. Othello is even worse. 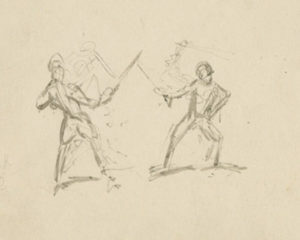 Image: George Cruikshank [Two Figures Fencing] [19th century]. Used by permission of the Folger Shakespeare Library under a Creative Commons Attribution-ShareAlike 4.0 International License. [i] Keira Travis, “Wordplay and the Ethics of Self-Deception in Shakespeare’s Tragedies,” in Michael Bristol, ed. Shakespeare and Moral Agency (London and New York: Continuum Books, 2010), p. 46. 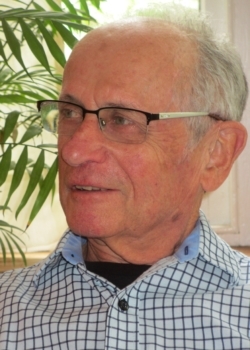 Michael Bristol is Greenshields Professor of English at McGill University in Montreal. He is currently enjoying retirement, although he does from time to time discuss Shakespeare with his friends over lunch at an excellent Thai restaurant.